I’m Sarah’s cousin Jenn, and like Sarah, I grew up in northern Minnesota. Despite an utterly Midwestern upbringing, I love Indian food. I especially love chicken tikka masala. For some reason this food from halfway around the globe is a comfort food to me. Some restaurants make it with just chicken. I like it with lots of veggies thrown in. Several years ago I started experimenting with various recipes I found online, and ended up creating my very own version — to my friends, I call it Jenn’s Tikka Masala. 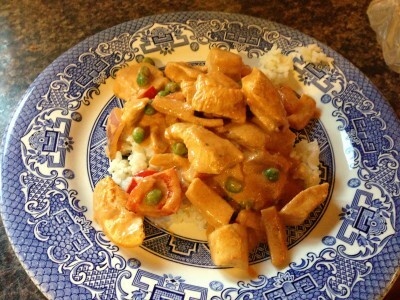 Keep in mind I’m not Indian so I don’t claim that this is a pure ethnic dish, but this is the way I like it! I highly recommend a rice cooker. 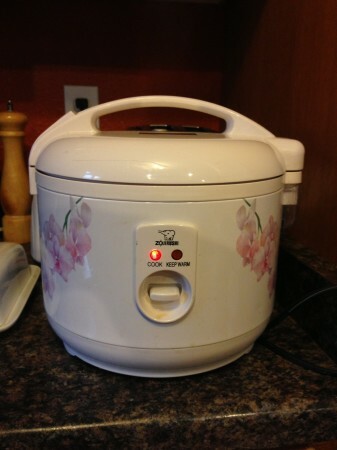 When I first met my husband, 10 years ago, he had this strange looking appliance with Asian characters written all over it–to me, it seemed to just be taking up room in the cupboard. It wasn’t long though before he introduced me to the true benefit of perfectly cooked rice. 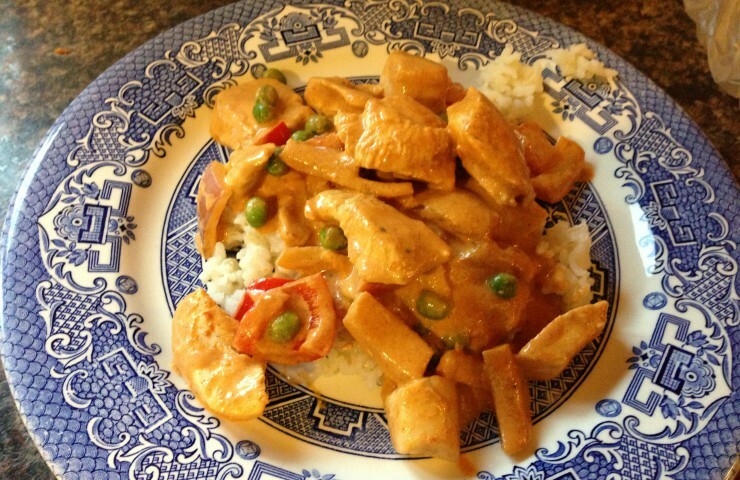 Cooking the rice takes awhile, so start the rice before cooking the chicken tikka masala. From what I can tell, chicken tikka masala starts with chicken prepared with spices and then grilled. Grilling on skewers seemed messy and complicated (am I just lazy?) so my version starts off with marinating the chicken and baking it. Cut up your chicken breast into bite-size pieces. In a bowl, mix your marinade. Start with some plain yogurt, and mix in cinnamon, cumin, cayenne, pepper, ginger, and a little bit of lemon juice. Add your chicken, stir, and pop it in the fridge to marinate for an hour or more, or, if you really don’t have time, you can even just put it right the oven and bake it as is. It’s just a little more flavorful to let it marinate for a while before you make it. You will want to bake it for about 20 minutes or until the chicken is done and no longer looks pink on the inside. While the chicken is baking, take out a large frying pan, melt some butter, and start with sautéing your jalapeno, cumin, and garlic. At this point your kitchen will start to smell like the Spice Islands. It is heavenly. 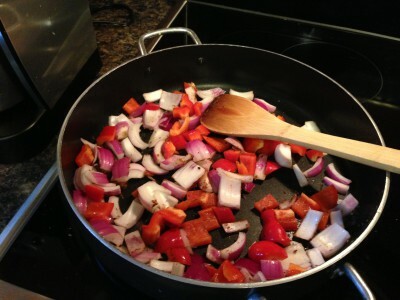 Add a whole bunch of onions and colorful sweet peppers, and sauté until just tender. To me, the true genius of tikka masala is in the perfect blend of tomato sauce and heavy cream. This recipe calls for one cup of cream, but sometimes I throw in a little more, just depending on my mood. Cook it with the tomato sauce and heavy cream and simmer until it thickens, about 20 minutes. At this point, you are ready to add the chicken. Just scoop it out of the baking pan, and if you want (my two-year-old especially likes this part), add some frozen peas. Simmer another 10 minutes, serve over rice. My take on an Indian favorite. 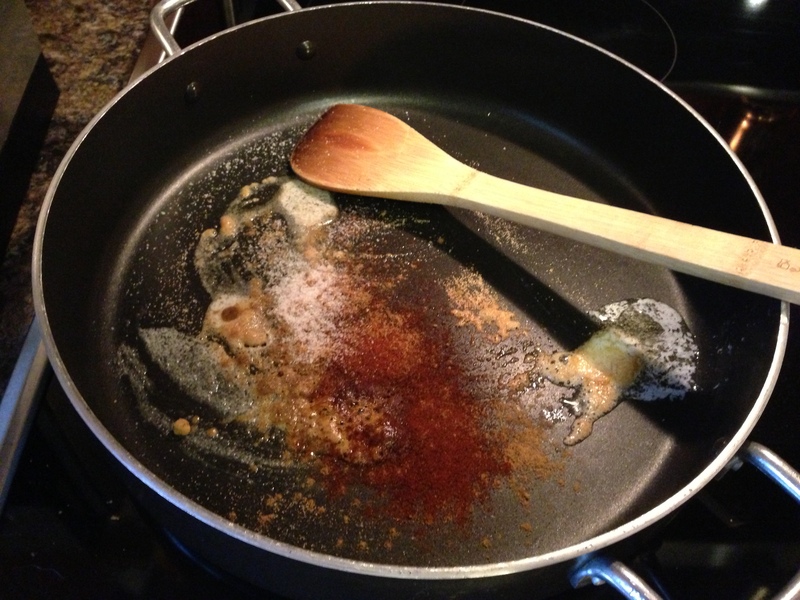 1)	In a large bowl, combine yogurt, lemon juice, cumin, cinnamon, cayenne, black pepper, ginger, and salt. 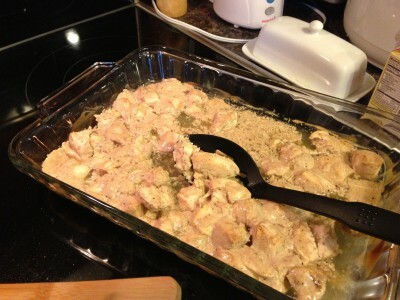 Stir in chicken, then refrigerate for 1 hour. 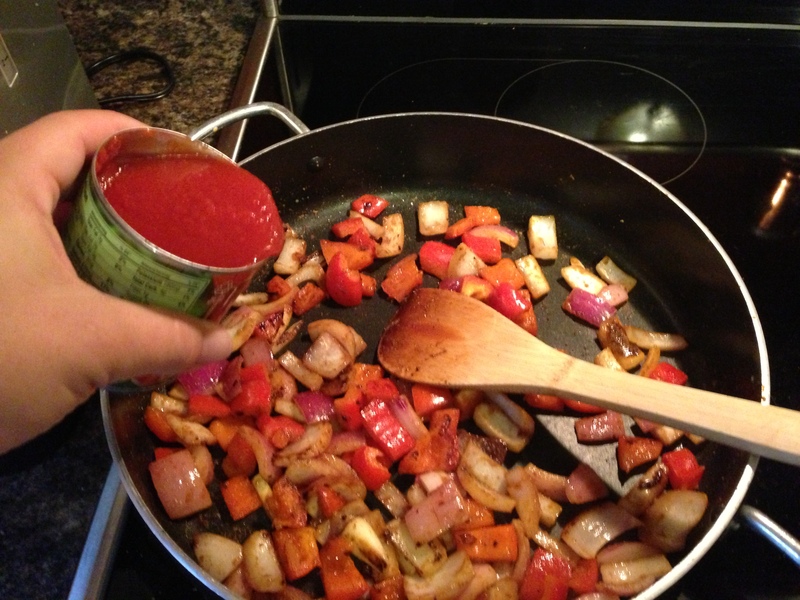 (The marinade process can be skipped if you are in a hurry). 2)	Bake the chicken while still in the marinade, until no longer pink (approximately 20 minutes at 350 degrees). Drain any excess liquid. 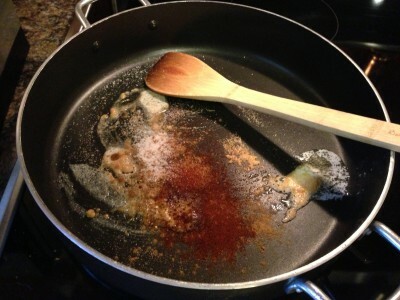 3)	Melt butter in a large heavy skillet over medium heat. Sauté garlic and jalapeno for 1 minute. Season with cumin, paprika and salt. 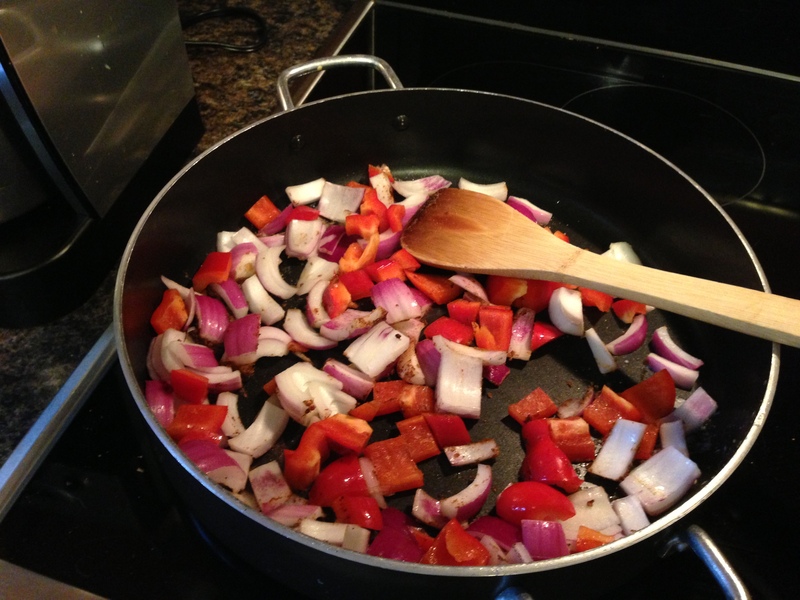 Add bell pepper, onion and tomato. Stir in tomato sauce and cream. 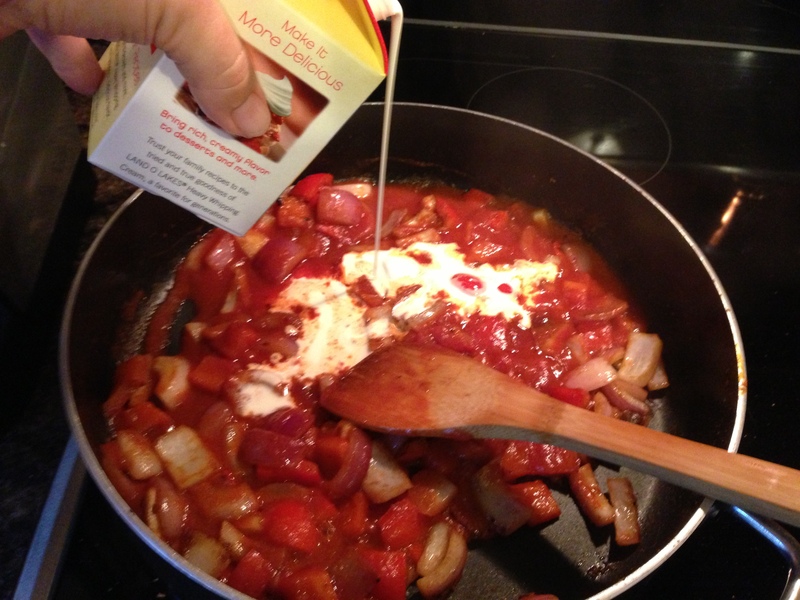 Simmer on low heat until sauce thickens, 20-30 minutes. 4) Add grilled chicken and peas (if desired), and simmer for 10 minutes.